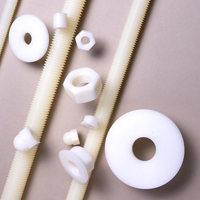 From the very start in 1973, Bluemay has manufactured a range of industrial fasteners in plastic – mostly from nylon, but also from acetal, polypropylene and other engineering plastics. Over the years the range has grown in size, and we continue to add to our list of products almost every week. As a manufacturer we use only 100% virgin raw materials and have our production systems certified to AS9100, the aerospace quality certificate, to ensure the production of engineering quality components as a solution to your engineering needs. While much of our range is supplied in standard metric sizes, we also have products available in Imperial BSW, BSF, BSP and American UNC and UNF sizes. Browse the individual product pages to get a flavour of the items and sizes available but should you not see the product, size, material or colour you are looking for then just telephone our technical Sales Team on 01380 821811 to discuss your requirements.